I realize it has been a tough weekend in a lot of areas. There have been major weather events such as wildfires, hurricanes, flooding and tornadoes. In many parts of the world political unrest is occurring and systems continue to be rattled everywhere. Strange and unusual events are occurring, including sudden roof and stadium collapses, shocking crimes and tragic death and destruction. No one seems entirely removed from it all as we continue to move forward at a crazy pace these days. However, in my own little part of the world, we still seem pretty detached from the "big collective drama" and I think that's worth celebrating. In fact, it's official: summer has begun. And that seems like cause for celebration in itself. That means relaxing in the shade watching your crops grow. It means the deck is opened, picnics are prepared, and we get to spend time closer to nature. But what's all that buzz about??? We had a rainy weekend and that kind of dampness, in combination with warm temperatures, has brought out the buzzing creatures of mosquitoes, black flies, bees, wasps and whatever other flying creatures seem to multiple in gigantic numbers and arrive at the picnic whether invited or not. In the big scheme of things, I realize that's not a huge issue. But it can really be cause for irritation and it doesn't always have to be. There are as many methods to repel them as there are creatures. Some of the "fixes" are no doubt as toxic to humans as they are to the bugs. In the natural world, there are lots of diet suggestions and ideas. You are supposed to eat bananas or not eat bananas- I can never remember which it is? Orange peel is supposed to work. Apple cider vinegar is suggested. (I'm not sure if that works but I know our horses do like the taste of it!). If you find something that works, in my opinion, you should stick with it. I'm not convinced there is really a "cure all" approach, but if you've got something please write me a comment to explain it! This year I would add the Perelandra combination essences of Immune and Lymphatic to the list. They may help prevent the reactions in the first place and work for both humans and animals. These are taken as a few drops every day and work to build up your immune system. They are recommended for animal issues with ticks and fleas as well. http://www.perelandra-ltd.com/HW10-W557.aspx I have found ETS Plus for Animals helpful for animals (particularly horses) that seem "crazed" by the unrelenting nature of the bugs when the weather conditions bring them out in droves. Much like Bach Flower Rescue Remedy, it seems to have that relaxing, accepting and adjusting value. To the Bach Flower essence list from last years posting, I would add Cherry Plum. Similar to ETS Plus or Rescue Remedy, this essence might help if you feel the buzzing, itching, irritating nature of pests might drive you out of your mind. A few drops of Cherry Plum might be helpful for that picnic guest that can't sit still and flees to the car because the bugs are driving him out of his mind. For many people, and animals, it seems as though early in the season, the reactions are more severe. Maybe we develop an immunity as the season wears on. If the hives have appeared, the bites are red and swollen, and the itching is severe, I still am a huge fan of the homeopathic Ledum. It's the dramatic, "make a believer" remedy. A few pellets of Ledum and the hives disappear. It won't prevent the bugs from biting you but it might settle down the reaction and provide immediate relief once they have attacked you. It's an excellent remedy to have in any human or animal first aid kit and just so happens to be the antidote for tetanus as well. I wouldn't send a kid to camp without it! Maybe there is a way to just "go within" and not be bothered or affected by the bugs. 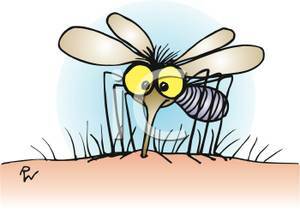 Maybe you can talk to the Deva of Mosquitoes like Wise Woman did once and work out an arrangement on acceptable territory! Maybe there are times of the year or times of the day when you just can't be that close to nature and you need to let the bugs have their chance in the scheme of things. In other words, a "retreat policy"? Believe both the transient spirit regarding these kinds of services.